Potato Cakes – are they Irish? I grew up with them (my Mom was Catherine, my Grandma Irene, my Great Grandma was Lizzie and I’m a Mollie) but I suspect even cooks that weren’t Irish made these beautiful little cakes when they had leftover mashed potatoes. What I do know is that Traditional Irish Potato Cakes are delicious, maybe even better than the original mashed potatoes they are made from. And for me, that’s sayin’ a lot coz I do love love love me some mashed potatoes! So these are the Traditional Irish Potato Cakes that are whipped up from any leftover mashed potatoes, not “Boxty” which are more like a pancake and made with both grated and mashed potatoes and originally hail from just a few counties in the North Midlands of Ireland, according to Wikipedia. 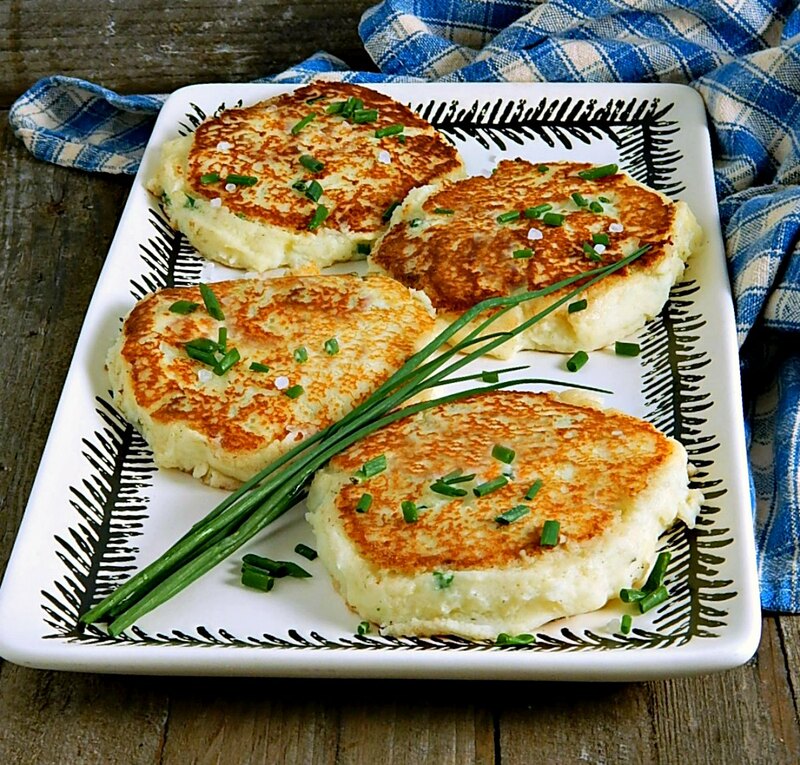 And while Boxty has been gaining in popularity and the recipe is spreading, these simpler Traditional Irish Potato Cakes are an example of the frugality of home cooks as a way to refashion leftover mashed potatoes into something fabulous. So what you have here with Traditional Irish Potato Cakes is a way to take your old, cold leftover mashed potatoes, any kind you have, creamy, chunky, cheesy, maybe even mashed potatoes that you might have thought weren’t even worth wrapping up and saving, into something utterly glorious. No leftovers? No problem. There are instructions to make from cold or leftover boiled potatoes, too, in the recipe, below. Your Traditional Irish Potato Cakes are going to have a delicate, lacy butter browned crust that has a very appealing, slight crispiness. And once you cut into that beautifully browned potato cake, you’re going to reveal the hot creamy mashed potatoes in the center. When I was a kid I loved to “lift” that crispy crust off the top of the potato cakes and only after I’d eaten that would I dig into the rest of the mashed potatoes left behind. And of course, when I was a kid, we didn’t have a sprinkling of sea salt over the top of our Traditional Irish Potato Cakes or a few chives, but heck, why not do it? And we certainly didn’t have any “add-ins” to our Traditional Irish Potato Cakes, but again, why not? I put a few suggestions in the recipe, below, or maybe you’ll be inspired by something you have hanging out in the fridge. I’ve been thinking about a spoonful or two of my Bourbon Bacon Jam mixed in but haven’t taken the plunge – yet! This is a “recipe” that’s not really a recipe, and here’s why. Leftover mashed potatoes are always a huge variable in this “recipe.” Every cook makes mashed potatoes differently, and every mashed potato behaves differently in a potato cake. Some mashed potatoes are chunky, others are thick and stiff, others, still, more refined. Some are mashed till they barely hold together, others are quite starchy, and some may even be beaten or whipped. Mashed potatoes vary in the amount of butter, and many have other add-ins, maybe cheese or cream cheese, sour cream etc, and when warmed they can get quite a bit softer. Some mashed have milk, some half and half, some buttermilk, and all in different amounts. That all affects how thick or thin your mixture for the potato cakes will be. So likely as not, you’ll have to give up the idea of a “recipe” that produces the “perfect” potato cake each and every time. You’ll have to tap into the inner cook and feel your way through this recipe and appreciate each batch of potato cakes as having its own personality. So I can get you close…very close…the rest is up to you! Keep in mind that sometimes your Traditional Irish Potato Cakes will hold together well, other times they might need gentle care, some will be a bit stiffer and some might flop and ooze a bit as they are turned. All of them are going to be gorgeous with their slightly crispy exterior and creamy center and all will taste fantastic. You just can’t get any more frugal that taking an ingredient, like leftover mashed potatoes, that could be a potential waste and turning it out for another meal. This recipe runs about $1.10 to make, but that’s counting all the ingredients in the mashed potatoes as well as the butter, egg, flour etc. in this recipe. Those items run about 25 cents. If you have leftover mashed potatoes but don’t want to make this recipe right away, just make these Traditional Irish Potato Cakes and freeze them to cook off, later. Instructions are in the recipe. When ready to cook, preheat a large skillet over medium heat, add butter and melt. Using clean hands, mix mashed potatoes, egg, and enough flour to form a “batter” that is quite thick, not creamy, and “mounds.” Add salt and pepper to taste and any optional ingredients as desired. The amount of flour needed is going to be dependent on how creamy and how rich the original mashed potatoes are – the more butter, cheese, etc. in the original mashed potatoes, the more flour will be needed. Do try to add as little flour as possible, though. Better to have a potato cake that runs a bit when heated than one that tastes of a lot of flour. Mix right before frying and keep the potato mixture cold; by the time the outside is nicely browned and crunchy, the inside should be heated through and there is less chance they’ll become too “oozy” by the time they are done when you start with cold ingredients. To cook, pick up about a quarter of the batter in one hand and form into a patty, much like a burger patty is formed. Place it into one palm and press and turn into a uniform, round, flat shape. Add to the hot pan; brown very slowly in the hot butter, turning once. Best if eaten at once. These may be dipped in flour or dipped in egg, then in flour if desired. They may also go through a breading process of dipping in flour, then egg, then breadcrumbs. If no leftover mashed potatoes are on hand, it will take about 3 to 4 medium sized raw potatoes to make about two cups of mashed. These may be made with leftover boiled potatoes, also. Simply mash, mix with a bit of butter and milk and proceed with the recipe. This is a great recipe for “planned” leftovers – simply make extra mashed potatoes so there will be plenty to make potato cakes. Potato cakes can be formed, make them rather thin, about 3/4″ thick, placed on plastic wrap and frozen. Once frozen, bag for later use. No need to thaw, simply cook as directed. Traditional Irish Potato Cakes made March 2014. This entry was posted in Click here for Fabulous Food Posts and tagged Family Recipe, Freezes Well, hearty sides, Heritage Recipe, Irish, leftover potatoes, leftover vegetables, Leftovers, Potatoes, Side. Bookmark the permalink. Thanks, We love them, and my kids did, especially. Hope you do, too! Delicious. I think these are just what we need!